How can I use Zapier with Deskpro? 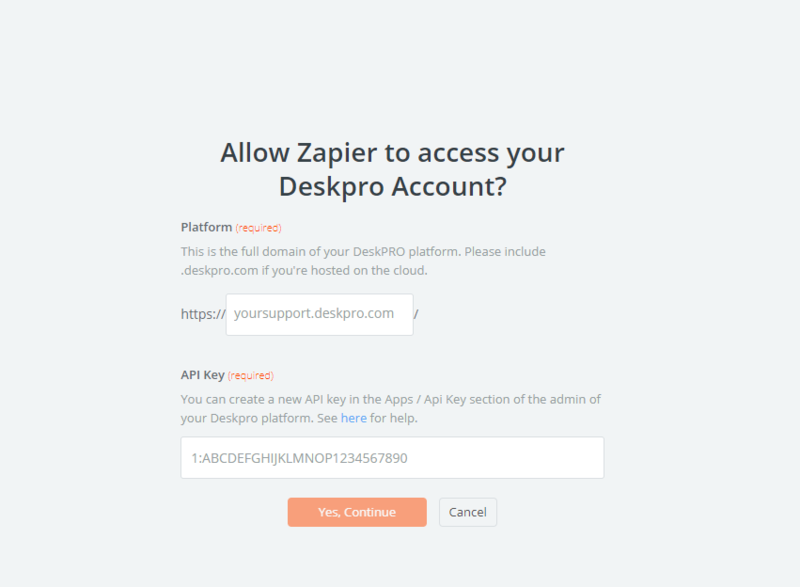 In order to integrate Deskpro with thousands of various applications, you can use the Deskpro-Zapier integration. Zapier is a handy automation tool which can pair and connect thousands of apps together. Using Zapier allows you to create powerful integrations, called Zaps, between Deskpro and other applications. 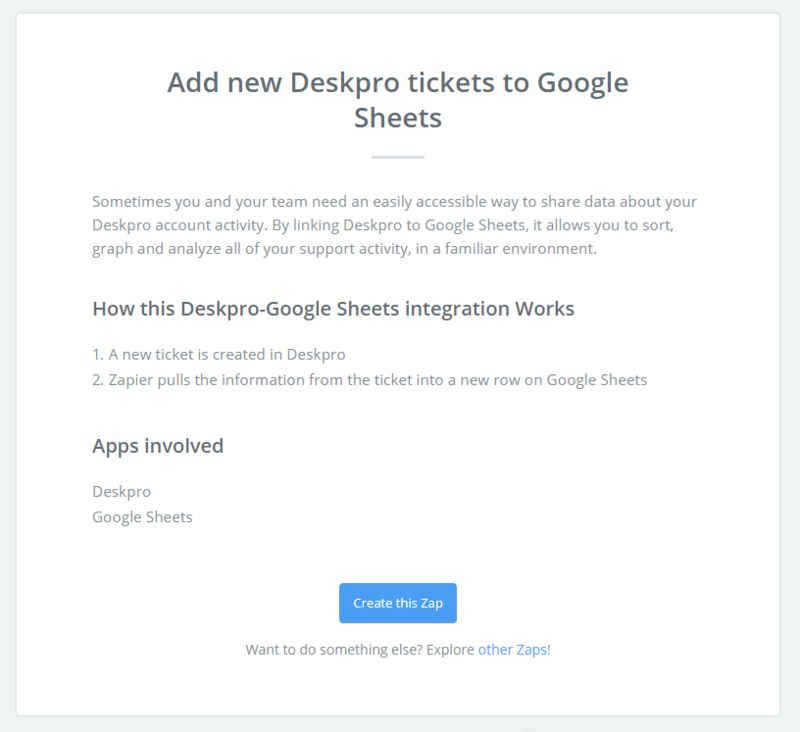 For example, we'll be using this article to demonstrate how to add new Deskpro tickets to Google Sheets - but there are thousands of other possibilities. 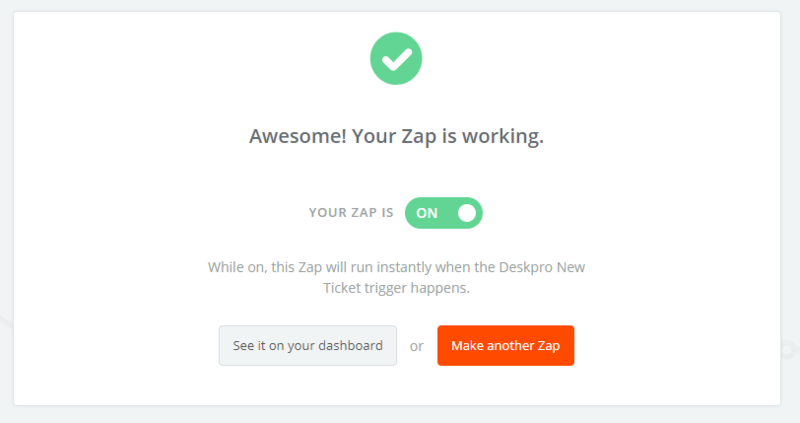 You can also configure Zapier to trigger actions within Deskpro in response to events in other applications too. Navigate to https://zapier.com/apps/integrations, and search for Deskpro in the search bar. Select Deskpro from the results. 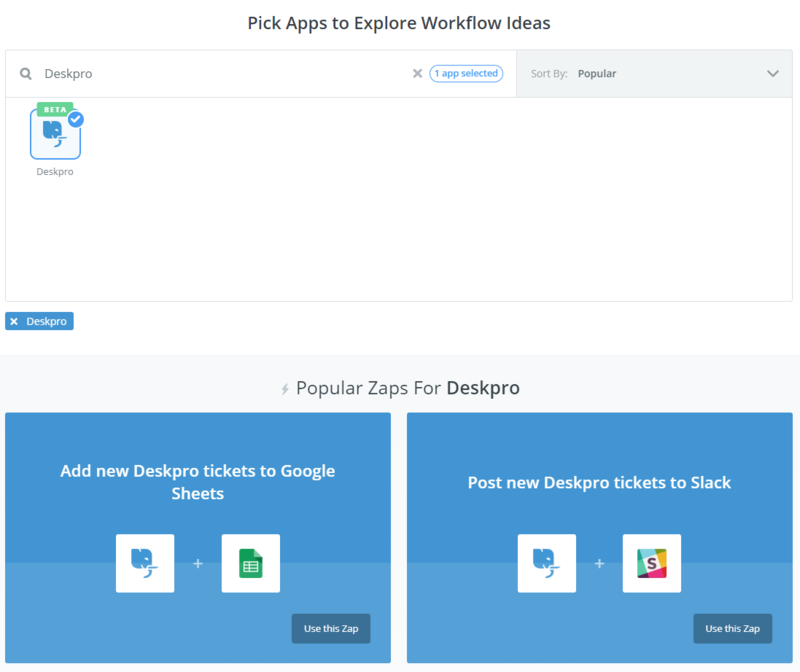 You will now see a list of popular Zaps for Deskpro. 8. Enter your helpdesk URL, and then your API Key. 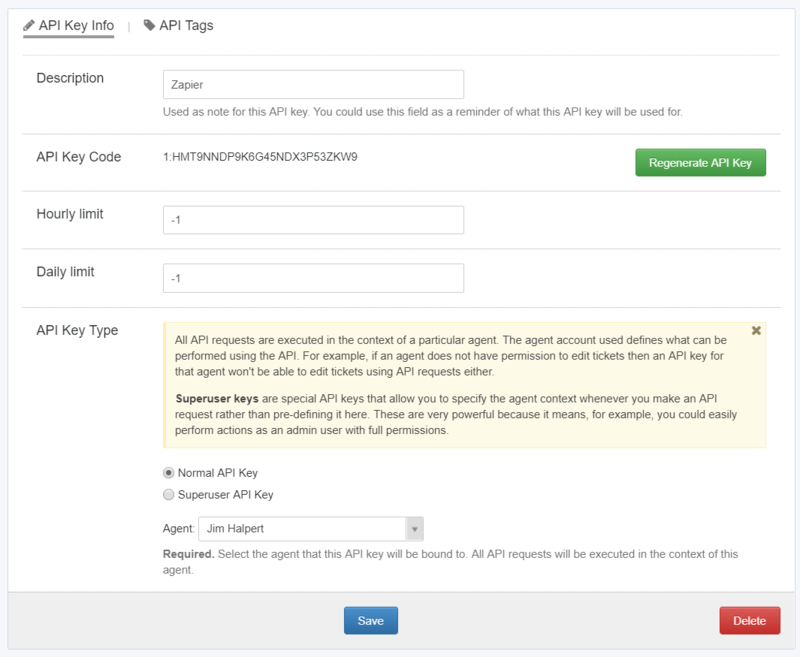 This can be found in the Admin Interface under Admin > Apps > API Keys. 9. Under Admin > Apps > API Keys Click + New API Key, enter a description, and set yourself as the agent in the dropdown menu, and click Save. 10. The API Key will now be generated. Copy and paste this into Zapier, and click Yes, continue to complete the connection. 11. Deskpro and Zapier will now be connected. Click Save + Continue. 12. 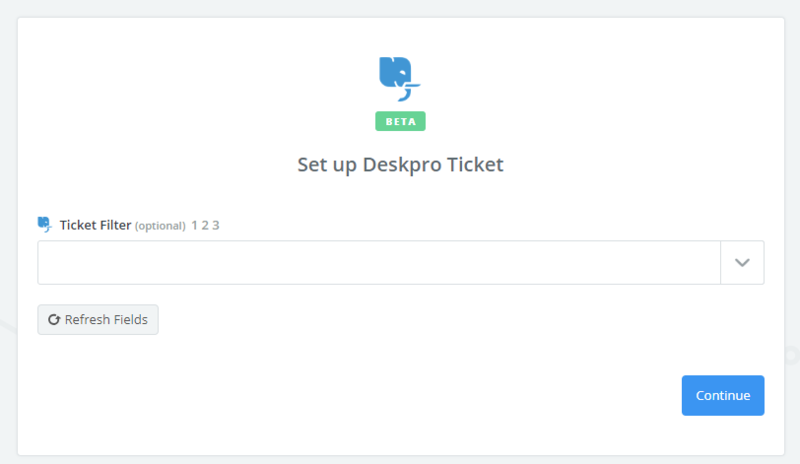 Zapier will now attempt to test its connection to Deskpro by fetching a ticket. When prompted with the optional Ticket Filter, ignore and click Continue, then click Fetch & Continue. 13. Now Zapier will determine the action in response to the event. It works a lot like Triggers in this way. 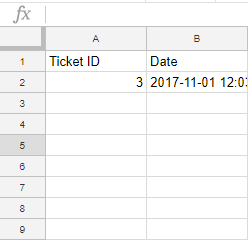 Create Spreadsheet Row should already be pre-selected. Click Continue. 14. Click Connect, this time to connect Google Sheets with Zapier. Follow the pop-up instructions from Google to connect with Zapier. 15. Click Save + Continue. 16. 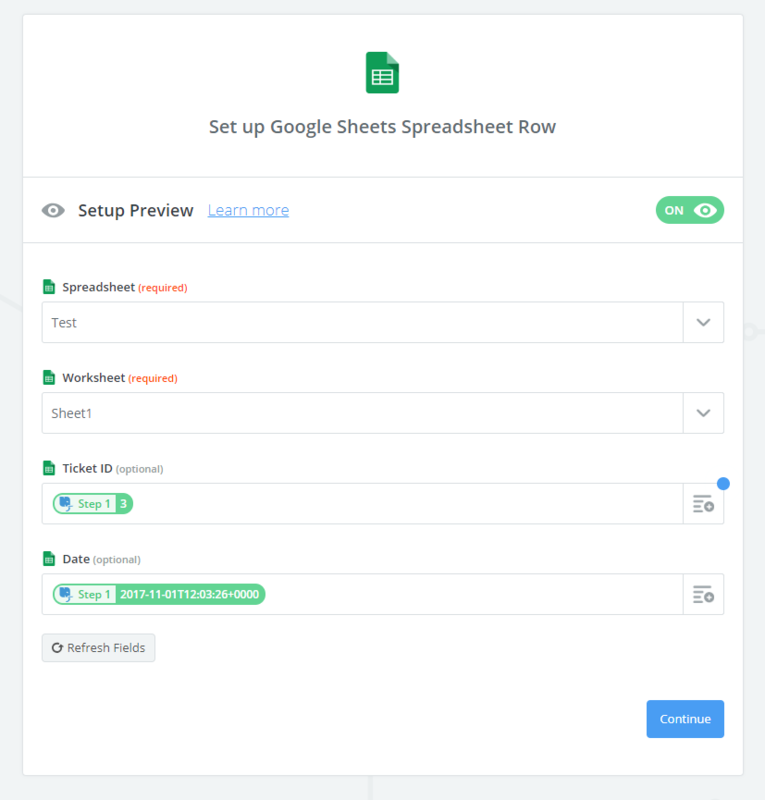 Now connect your desired spreadsheet to Zapier. This is the one that will be populated with new tickets from Deskpro. In the spreadsheet itself, you can create a number of headers which Zapier will populate with the Deskpro properties you can define. 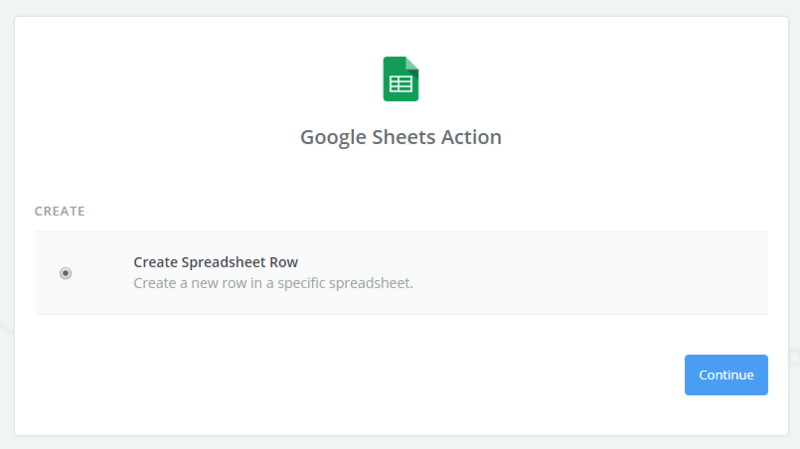 This article provides more information regarding setting up your Google Sheet appropriately. 17. 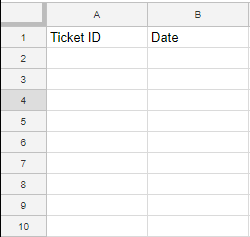 For this example, we've used Ticket ID and Date as headers in the Google Sheet, and mapped them using Zapier to the corresponding Deskpro ticket properties. You can use any set up you wish. Click Continue. 18. Now Send Test To Google Sheets. As you can see, the Google Sheet has been updated with dummy data. 19. Click Finish. Your Zap will turn on automatically. This is just one of thousands of possible Zaps you can create to integrate Deskpro with other software in powerful ways. Now that you're familiar with how it's done, try experimenting with other combinations. If you discover something cool or useful, be sure to get in touch and share it with us - we'd love to hear about it!